24 7 News Net - Hurricane Lili aims for MAJOR US HIT! $100,000.00 GUARANTEE - That the US Federal Case mentioned in this story is REAL! Here is a link to a copy of the Criminal Complaint of case CR 95 972 M.
WATCH OUT if you live in the New Orleans or Corpus Christi area in the USA! HURRICANE LILI is coming and it is set to strike on the SEVEN YEAR ANNIVERSARY of a famous HURRICANE PROHECY issued in US Federal Court by Sollog aka THE PROPHET OF JUDGMENT or THE PROPHET OF DOOM! On October 4th 1995 SEVEN YEARS AGO THIS FRIDAY (the EXACT date that Lili is expected to be in the news after hitting the USA is this Friday October 4th) Sollog warned a US Magistrate THE WRATH OF GOD ALMIGHTY was about to strike the USA. He said it was PUNISHMENT for the USA developing nuclear weapons. 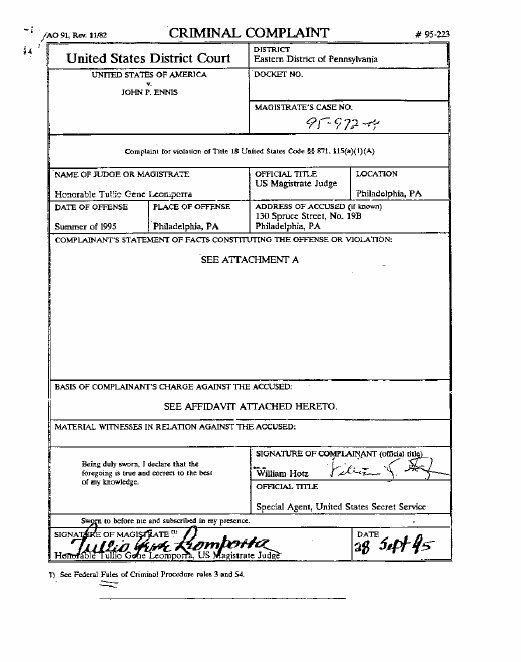 The case was USA vs John Ennis aka SOLLOG CR 95 972M in the Eastern District of Pennsylvania US Federal Court System! On October 5th 1995 Opal struck the USA and became the third costliest hurricane in US History. Is Lili about to become one of the MAJOR HURRICANE DISASTERS in US History? We'll all know by this Saturday how badly Lili will strike the USA! Now I've researched this famous court statement in depth since I wrote it about in regards to several chapters in a book I did on Sollog. The reason is Sollog warned in the SAME STATEMENT that a world leader would die from assassination on 11/3 of 1995. On 11/4 Rabin was killed exactly as Sollog described in his October 4th 1995 Statement (Sollog is known for being ONE DAY or ONE YEAR off in his most famous prophecies). A few days after Rabin was assassinated the US Government dismissed the case against Sollog. The case came about because of a public letter Sollog had written to then President Clinton stating if Clinton went back to Jackson Hole Wyoming his plane would be knocked out of the sky. Clinton didn't heed the WARNING and one year later a US Presidential support plane crashed IN JACKSON HOLE WYOMING where Sollog had warned the US President to never go again to avert tragedy! Nine people died in the crash of the Clinton support plane! A plane that Ron Brown was suppose to be on! In the Sollog forums at Sollog.com some fans are saying Corpus Christi is the target of Lili, since if this area is struck it will mean that all three cities Sollog named in his famous NINE SIGNS before NUKE TERRORISM prophecy have been struck. The cities that Sollog warned of being hit by hurricanes before NUKE TERRORISM hits Israel are Corpus Christi, New Orleans and Miami. New Orleans had a direct hit last week by Isidore. A once powerful hurricane that weakened to just below a hurricane when it came ashore near New Orleans. It caused the worst flooding in Louisiana in two decades. The Miami area was flooded as was much of south Florida last year from hurricane Michelle. Some Sollog fans think that was a hit for the Sollog NINE SIGNS prophecy before NUKE TERRORISM occurs. Other Sollog fans say to expect more literal hits by hurricanes on the three cities Sollog named. So look for MAJOR HITS on Corpus Christi, New Orleans and Miami. Yet, other Sollog fans say the hurricane doesn't have to do much damage and it should be Corpus Christi. That in their eyes would mean all three hurricane cities Sollog named have been struck within 12 months! A MIGHTY SIGN INDEED! It is interesting to note that in the 1995 October 4th Statement Sollog explained that in ancient times August the current eight month was really OCTOBER, so his recent IDES OF AUGUSTUS Prophecy can be now easily understood to mean THIS OCTOBER. What did Sollog warn of in his IDES OF AUGUSTUS PROPHECY issued this past August? Oh little things like GREAT QUAKES and MAJOR HURRICANES. And the death of the POPE! Some other SIGNS Sollog gave in his NINE SIGNS BEFORE NUKE TERRORISM WARNING are major quakes in LA, NYC, Philly and Phoenix! Earlier this year Sollog issued IMMINENT QUAKE WARNINGS for LA and NYC. The largest quake in the LA basin struck within 24 hours of the first Sollog LA-NYC Quake Warning. A month or so later Sollog again issued an IMMINENT QUAKE WARNING for NY. Days later the largest quake on the east coast in over 30 years struck in NY! Some Sollog fans see these as HITS for the Sollog NINE SIGNS WARNING. Others expect large quakes to actually level NYC and LA as well as Philly and Phoenix! All I know is that this Friday is the SEVEN YEAR ANNIVERSARY of the date Sollog told a US Magistrate GODS WRATH was to strike New Orleans and Corpus Christi. Hurricane forecasters are already warning LILI is expected to grow into at least a category 2 if not 3 hurricane by the time it hits anywhere from Corpus Christi to New Orleans. If LILI hits either New Orleans or Corpus Christi as a category 3 hurricane, expect major loss of life and hundreds of millions in damage. Over the years I've written a couple of books about Sollog and his prophecies. I've seen him hit exact dates and locations for major rare 7.0+ range quakes. My publisher was harassed for publishing one of my books after 911 occurred, since that book THE PROPHECIES OF SOLLOG had the complete details of 911 in one of the prophecies. That prophecy was written in September 1997 and distributed all over the Net and discussed by thousands in Usenet before 911 occurred. It stated MAJOR TERRORISM would occur in September. It warned of tragedy to NYC. It stated BIG BANG BIG BUILDING. Four years later 911 occurred EXACT AS Sollog WARNED! It looks like HURRICANE LILI will now repeat history. A famous Sollog WARNING will be validate a few years from when Sollog warned of the exact details of the future! If you live in the GULF COAST from Brownsville Texas to say Tampa Florida, I WOULD LEAVE NOW! The GULF COAST looks like a disaster zone if you read Sollog's October 4th 1995 WARNING. Who wants to see GODS WRATH first hand? If you do go to Corpus Christi or New Orleans. It looks like a sure thing that GODS WRATH will be striking at least one of these cities this week! Oh, it looks like a good probability that the Pope in Rome will finally die on a date this month connected to either the 13th or 15th or the 13th of the new moon. But with Sollog you might have to wait a year or two for it to occur. It seems Sollog is content to give the exact details and hide the exact year from us mortals. Afterall, if he hit the date and year for these ACTS OF GOD many would be saying HE IS GOD! Who does Sollog says he is? THE WORD OF ONE and THE WORD OF LORD GOD ALMIGHTY are two of the main titles he claims. Some fans of Sollog are now saying in his Forums that the TX/LA (Texas - Louisian) state line may be the location where Lili hits. 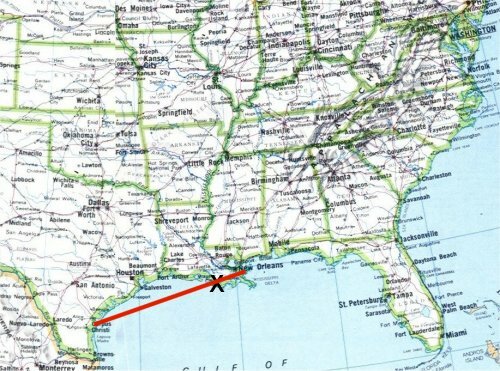 The reason is that the Port Arthur area near the state line of TX/LA is the middle of the line on a map when you connect the two cities Sollog named, those being Corpus Christi and New Orleans. Which is a known Sollog code. See map below. Others say New Orleans will be struck and many could die in the Super Dome due to a roof collapse which Sollog is said to have warned of on a radio show in the past. Others feel it will be Port Arthur area near the state line of TX/LA since this city is on the Corpus Christi to Boston Line of tragedy that Sollog is known to have written about. Recently several accidents have struck that line as well. See our articles on the NIKKEE PROPHECIES. In 1995 Opal struck Pensacola Florida, it was the third worst financial cost from a US Hurricane. Opal and Hurricane Adnrew both struck what fans of Sollog call the LINE OF SOLLOG. This line is formed on a map of the USA when you connect Miami to Oklahoma City to the Seattle Area. Many tragic events have struck this line. Hurrianes Opal and Andrew. The Versace Murder. Plane Crash Valujet 592. The kidnappings of Jon Benet Ramsey and Lisa Smart. The Oklahoma City bombing. Several school shootings including Littleton Colorado the worst school shooting in US History. 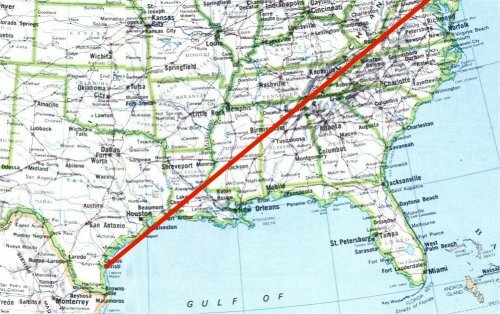 The map below shows how Corpus Christi, New Orleans and Pensacola form a perfectly straight line that intersects the famous LINE OF SOLLOG! The latest landing location for Lili according to fans of Sollog is MORGAN CITY which is just south west of New Orleans. This location is ON THE LINE from Corpus Christi to New Orleans. 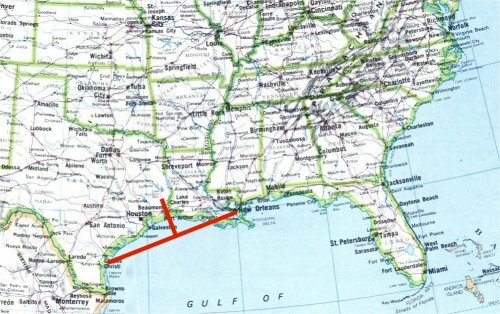 In fact it is the first piece of land on that line going east to New Orleans from Corpus Christi. Lili should be starting to turn to the northeast as it makes landfall near Morgan City. The new stop is just west of New Orleans. That means THE WORST PART OF THE HURRICANE the dreaded NORTHEAST QUADRANT will blast through New Orleans. 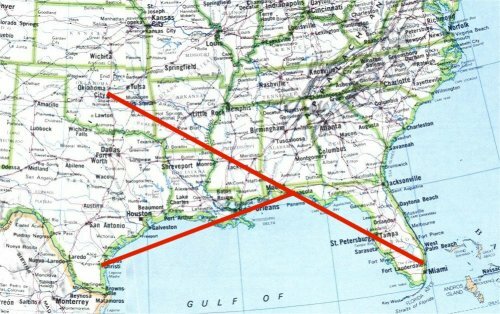 Here is map showing the fact that Corpus Christi, Morgan City and New Orleans are all on a perfectly straight line! Headlines on October 4th 2002 about Lili will be on the SEVEN YEAR ANNIVERSARY of the Sollog New Orleans Hurricane Warning. Will it be another LITERAL HIT of an ACT OF GOD for Sollog? Or will his simple CODE hit the exact area Lili comes ashore? Lili has already become a major category 4 hurricane, it may intensify to a category 5 hurricane. If it does and it strikes New Orleans it may become the worst disaster in US history! Will people then listen to what Sollog has been saying for SEVEN YEARS about NUCLEAR TERRORISM HITTING ISRAEL?